WASHINGTON, D.C. -- The vast majority of Americans believe that driving while impaired by alcohol is a "very serious" problem (79%) on the roads today. This swamps public concern about people driving while impaired by prescription painkillers (41%), marijuana (29%) or prescription antidepressants (28%). 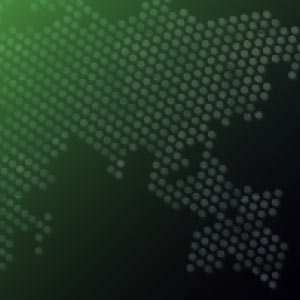 Still, according to the June 24-25 Gallup survey, most Americans believe people's use of each of the four classes of drugs is at least a somewhat serious problem for traffic safety, but this ranges from a high of 97% for alcohol and 83% for prescription painkillers to 68% for marijuana and 64% for prescription antidepressants. The question didn't ask Americans to estimate the severity of impairment each substance produces, but to say more broadly how much drivers' use of each substance affects traffic safety. Respondents may be evaluating both the severity of impairment and the prevalence of use by drivers, which may partly explain why more Americans view drinking alcohol as a threat to road safety than they do marijuana or prescription drug use. Americans' awareness of the dangers of drinking and driving increased in the 1980s, when organizations such as Mothers Against Drunk Driving warned against driving under the influence of alcohol. Yet while marijuana can impair reaction time during driving simulations and in driving tests, some experts, including the Pacific Institute for Research and Evaluation, assert that driving while high is not as serious a problem as driving under the influence of alcohol. But if legalization of marijuana continues across the U.S. and in turn increases usage or emboldens people to take more risks with driving after using marijuana, public attitudes about the threat this poses to driving could change. Across age groups, Americans aged 18 to 29 (88%) are the most likely to say drinking and driving is a very serious problem, perhaps because of effective communication from anti-drinking-and-driving groups. At the same time, they are the least likely age group to consider people driving while impaired by marijuana to be a very serious problem (22%). This is consistent with previous Gallup research showing young Americans are the most likely to say they currently smoke marijuana. 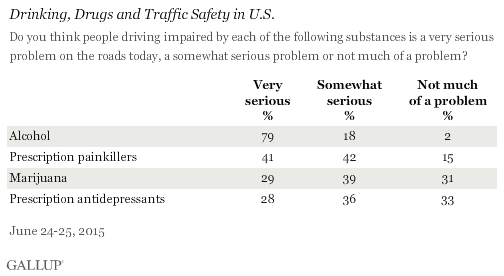 While a large majority in each age group say drinking and driving is a very serious problem in regard to road safety, less than half in each group say prescription drugs or marijuana are "very serious." Marijuana legalization has occurred largely in states that have voted Democratic in major elections in recent years, including Colorado, Washington and Oregon. Perhaps accordingly, Democrats are significantly less likely than Republicans to consider drivers impaired by marijuana to pose a major safety problem on the roads. Democrats, on the other hand, are a bit more likely than Republicans to believe use of prescription antidepressants poses a very serious threat. After more than 30 years of anti-drinking-and-driving campaigns, it seems that Americans -- especially younger adults -- have gotten the message that drinking and driving is a very serious problem. However, far fewer view marijuana and prescription drugs as a threat to road safety. With an explosion of prescription drugs in the U.S. -- Time recently called the abuse of painkillers a "national epidemic" -- the lines of how acceptable it is to drive under the influence of these drugs may not be as clearly drawn as they are for alcohol. These drugs may be legal, but abuse and misuse are still possible, and people may not have a clear understanding of when and in what ways they are impaired. In addition, while a growing number of states are legalizing marijuana, Americans are largely not convinced that it impairs drivers enough to cause serious problems on the roads. It is possible that more Americans say alcohol is a serious problem for road safety because drinking is much more prevalent than using prescription painkillers, antidepressants or marijuana. Nearly two-thirds of Americans say they drink alcohol, whereas 19% report using a mood-altering drug nearly every day and just 7% admit to currently smoking marijuana. Or Americans may believe that these drugs are simply not as harmful as alcohol and can be "managed" more effectively while they drive. For example, it is documented that some who have smoked marijuana may at times be able to overcompensate for their impairment when driving, while drunk drivers may deny that they are impaired at all.